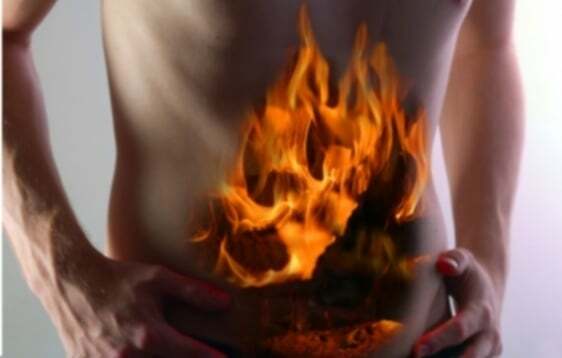 If you suffer with any inflammatory intestinal condition, you know that it can take over your life. I have clients who have a lot of anxiety about going out in public or to parties or events because they never know when a flare-up might hit, and what if there isn’t a bathroom near? I have a lot of empathy for these folks, because many of them have been through the ringer and seen numerous GI doctors, had colonoscopies and extensive testing only to be told “we can’t find anything wrong with you.” They’re usually then given a diagnosis of IBS so they can be prescribed steroidal medication for the inflammation or the symptoms. Sometimes they’re sent packing and told that’s just “normal for them.” That makes me cringe. I can’t tell you how many times I’ve heard these same stories over and over again. Being doubled over in pain and running to the bathroom over five times a day is normal? I don’t think so. If you’d rather not use a drug to cover the symptoms of IBS and want to address the root cause and correct that so you can be drug free, this post is for you. IBS stands for irritable bowel syndrome, a disorder that leads to abdominal pain and cramping and changes in bowel movements. It’s the blanket diagnosis most folks are given, then they can be prescribed drugs to treat the symptoms. IBS-C refers to IBS symptoms present with constipation, and IBS-D presents predominantly with diarrhea and cramping. A staggering 1 in 6 people in the U.S. has symptoms if IBS. I think it’s increasing for a number of reasons, including a rise in the incidence of food sensitivities, possibly due to in part to genetically modified foods and our super sanitary lifestyles that are causing changes in our immune system’s ability to fight invaders (see hygiene hypothesis). Certainly overuse of antibiotics and changes in our gut microbiome are a main factor. Causes are unclear, but triggers include gut infections like parasites, SIBO (present in 80 percent of IBS cases! ), dysbiosis, leaky gut, pathogenic bacteria that can hitchhike in on undercooked food or contaminated water, or stress triggers and cortisol fluctuations that can cause intestinal contractions. Hidden food sensitivities (dairy or gluten, for example) to which the person is unaware can be a trigger, because the person continues to eat that food, which causes inflammation and makes the gut more permeable and prone to dysbiosis. This bad bacteria overgrowth can alter gut and immune function, and the chronic inflammation over time may trigger IBS. Symptoms vary but usually include abdominal cramps, pain, bloating, consistent diarrhea or alternating diarrhea/constipation; chronic constipation; frequent, loose, watery stool or trouble controlling bowel movements; sudden urges that strike, or as one client put it, “the inability to trust a fart.” Weight loss or decreased appetite is a side effect too. Often people with IBS experience “flares” where they have debilitating pain and are on the toilet for long periods of time throughout the day. The flares come and go, and some folks aren’t sure what triggers them. So. How to treat it? First off, see my 4 step guide for overcoming IBS here. Often I get clients who are coming to me as a last resort because they have seen multiple GI doctors and even had stool testing that showed nothing was wrong. Needless to say they are frustrated and feeling awful. Or, they’ve been prescribed steroidal drugs or other meds with side effects and want to address to root cause instead of managing their condition with a drug. The conventional recs include avoiding stimulating beverages like coffee or tea and increase fiber. This can actually cause more harm in certain people off the bat. Read more about that here and here. If your GI doctor tells you to eat a bland diet based on whole grains, run! These foods can be major digestive irritants. Let’s talk about treatment from a holistic standpoint. Step 1. Remove inflammatory foods, potential allergenic foods, FODMAPS. The first thing I do is have the person remove any potentially inflammatory foods to allow the gut a chance to calm down. The big ones are gluten, dairy, soy, corn, sugar, and certain carbohydrate starches present in FODMAP foods. People with IBS have trouble digesting certain polysaccharide starches, which aggravate symptoms. Research indicates that SIBO is a huge factor in Crohn’s and IBS cases, and most IBS cases do very well avoiding FODMAP foods because they may have carb or fructose intolerance. FODMAP foods feed SIBO and can cause major pain and bloating. Breath testing will reveal is SIBO is present. It is crucial for anyone with an IBS diagnosis to be tested for SIBO. Start by removing irritating starches such as grains, certain legumes, and potatoes, and identify potential food sensitivities. The most common food allergies are wheat, dairy, eggs, soy, beef, citrus, nuts, shellfish. Ideally I’d have the person do a stool assessment to test for underlying gut infections, and we’d address those. Bacteria, pathogens, and parasites can cause or aggravate IBS. Herbs can kill off these overgrowths or infections. Avoid coffee and alcohol, which are gut irritants. Highly recommend the SCD diet, and I often recommend a combination SCD/low FODMAP to reduce symptoms. Once you’ve eliminated potential problematic foods and treated any digestive infections or SIBO, it’s time for some healing gut work. I use GI Revive (Designs for Health), high in glutamine, to heal the gut lining. High doses of probiotics are necessary, too. Vitamin D and essential fatty acids are needed to combat inflammation and boost immune health. Addressing adrenal health and cortisol levels is necessary, too. Throughout the process and for maintenance, it’s crucial to include healing foods such as bone broth and gelatin; foods high in anti-inflammatory omega3s such as fatty fish, sardines, and leafy greens; easy to digest, cooked veggies like winter squashes and greens; good fats like coconut oil & butter (if dairy is ok); fermented foods such as raw krauts for their probiotics and enzymes. Let’s clear up a couple myths: first off, adding more fiber can be more of an irritant than a benefit. Some types of fibers– especially insoluble such as certain vegetables, grains, and bran– can cause pain. Psyllium can be an irritant too. Cruciferous veggies can be hard to digest, as can raw foods. Secondly, digestive enzymes are typically recommended to help break down foods if you have compromised digestion, but the hydrochloric acid in some of the formulas can irritate and cause pain. Be careful and read labels: you may need an enzyme with no HCl. To sum it up, try a diet low in irritating starches such as low FODMAP and/or SCD; do a GI assessment/SIBO testing and get rid of underlying infections; add the therapeutic foods; do leaky gut repair; address adrenals/cortisol levels. Over time as you feel better, you may begin to start adding in more foods and see if you react. I have IBS and following a low FODMAPs diet has helped a lot. I found drinking aloe vera juice helped tremendously. It just seems to calm, sooth and settle everything. Not sure quite how it does it, but it does. Oh and I was less tired too … bonus. Well worth trying something natural like this. I think other non-western cultures are clued up to the power of natural plants, and now I cannot sing the praises of this stuff highly enough. I’ve been getting mine for the past year from http://www.forever.uk.com. you present here. Please let me know if this alright with you. one can without difficulty understand it, Thanks a lot. I am afraid IBS and IBD are very different things. IBD when they have found ulcers that have been tested. The way you have described this in the first paragraph is quite misleading. IBD is a serious diagnosis as is IBS and there are lots of ways to treat them. Do you have any evidence that rice does cause inflammation?